The Outside-In Approach to Technical Writing. Don’t write about what you know; write about what the reader needs to know. The Outside-In approach is the technique of writing the document from the reader’s point of view rather than your own. In order to do this, we must first analyse the audience. Analysing the audience will allow you to determine the key message of the document and what you need to communicate in order to make the message understood. When using the Outside-In technique you must begin with the general and move to the specific; make sure that the most important information in each section or paragraph appears first rather than last. This will mean that the document will be more readable and more easily understood. 1. Determine the key message. 2. Decide what you need to communicate to make the message understood. 3. Give the big picture first. 4. Start with the most important information. 5. Let the detail follow. 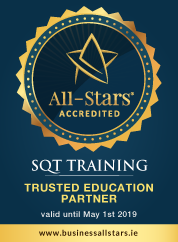 John Lafferty is our Technical Writing Skills course tutor at SQT John also delivers courses in Quality Systems, Process Validation, Software Validation and Quality Risk Management on behalf of SQT. John runs a highly successful Quality Management Consultancy, Northridge Quality & Validation, which specialises in assisting companies in the Life Sciences manufacturing sector.